The sad news coming down this afternoon that Roy Disney, nephew of Walt Disney and longtime upholder of the family legacy, has died at the age of 79 following a battle with stomach cancer. 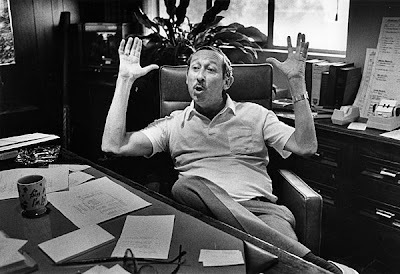 Few will argue that Disney as an entertainment brand would not be anything like the powerhouse it is today were it not for Roy Disney fighting behind the scenes: both to foster creative drive and in the corporate boardroom. His history with Michael Eisner - the man who Roy Disney first brought in as chief executive officer before being ousted in a stockholder coup led by Disney - is the stuff of business legend. I don't know if there's any comfort in saying this, but I'm glad that Roy Disney lived long enough to see his uncle's company return to traditional animation before he passed. I haven't seen The Princess and the Frog yet but that Disney's 2-D department has been revitalized is a huge victory for Roy Disney. Thoughts and prayers going out to his family. And Los Angeles Times has a fascinating article about his career. Did you hear Oral Roberts died as well? Yeah. I've mixed feelings about Roberts. Sad to hear about his passing (as I am about anyone... well, most people anyway). But in many ways he was the father of the "prosperity gospel" that has, in my humble opinion, done a lot of damage to modern Christianity. But in the end, it's not for me or anyone else to judge his soul. I'll let the matter rest with God, and be content with that.